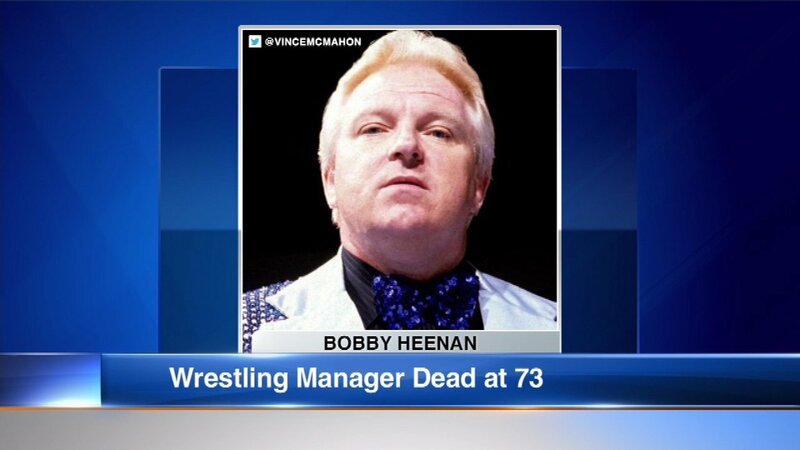 CHICAGO (WLS) -- Legendary wrestling manager Bobby "The Brain" Heenan has died. Heenan was born in Chicago where he started his wrestling career. He made his WWF debut in 1984 as Jesse Ventura's manager and later on as Andre the Giant's. A cause of death has not been announced. Heenan was 73-years-old. WWE (formerly known as WWF) released a statement saying, "WWE is saddened to learn that WWE Hall of Famer Bobby Heenan, regarded by many as the greatest manager in sports-entertainment history, has passed away at age 73. With a career spanning more than four decades, Heenan was the "The Brain" behind some of the most prolific superstars in sports-entertainment history. Heenan plied his trade as their mischievous manager by running his mouth on their behalf with a sarcastic wit considered among the best in the business. Heenan named competitors under his guidance as the Heenan Family, a moniker meant to show the strength of their alliance over any opposition. Members of the Heenan Family in the AWA and WWE read like the who's who of sports-entertainment, including Legends and WWE Hall of Famers such as Nick Bockwinkel, the Blackjacks, Big John Studd, King Kong Bundy, "Ravishing" Rick Rude, "Mr. Perfect" Curt Hennig, the Brain Busters (Arn Anderson and Tully Blanchard), Harley Race, and of course, the first WWE Hall of Famer, Andre the Giant, whom Heenan led to the ring at WrestleMania III before 93,173 fans. As impossible as it may seem, Heenan's overwhelming success as a manager was matched by that of his announcing career. Heenan's constant verbal jousts with fellow WWE Hall of Famers Gorilla Monsoon and "Mean" Gene Okerlund on USA Network remain among the most memorable moments in sports-entertainment history. In fact, "The Brain" was so entertaining that "The Bobby Heenan Show" had a brief run on USA Network as well. In addition, "The Brain" was part of the original broadcast team for Monday Night Raw in 1993, and also sat at the announce table for both Raw and WCW Monday Nitro. WWE extends its condolences to Heenan's family, friends and fans."